A Review of Rahul Mehta’s No Other World (Harper, 2017). This novel was definitely one of the most anticipated releases of 2017; Rahul Mehta’s first publication, a collection called Quarantine, is one that I’ve taught a number of times in my classes. 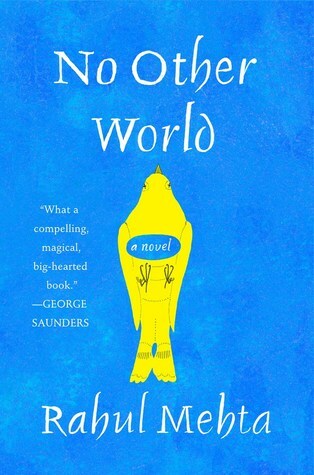 Mehta’s debut novel No Other World is an impressive work, one that spans cultures and continents, while also conveying the complicated lives of South Asian migrants. Mehta chooses a shifting third person point-of-view, primarily following the married couple, Nishit and Shanti, and their two children, Kiran and Preeti. The opening of the novel sees Kiran obsessively watching his neighbor’s house. As we discover, Kiran is desperately seeking a glimpse of the father living in that house, an All-American type upstate New Yorker named Chris Bell. Mehta patiently unfurls the complicated narrative, revealing that Kiran’s desire to see Chris Bell is wrapped up in the complicated dynamics of his mother’s never-quite-consummated love affair with Chris Bell as well as his own growing pains. The first third of the novel tracks this particular South Asian family as it adjusts as well as it can to small town dynamics. The second shifts perspectives slightly to Kiran’s cousin Bharat, who comes to the United States due to a prophetic warning offered by a seer. This particular section tracks Bharat’s disenchantment with the United States, especially as he develops a severe allergic reaction that seems to mirror his feelings for this alien landscape. For his part, Kiran does little to help Bharat acclimate and instead becomes mired in his own dilemmas. The third section of the novel shifts to India. It is at this point that readers discover Kiran is queer and that he is suffering from a serious depression. His parents’ unconditional love drives them to encourage Kiran to travel to India, where he can further explore his roots. Kiran’s parents believe that such a trip will allow him to gain greater perspective on his family and perhaps offer him a mental salve that will help enable him to battle his depression. Mehta’s novel is most successful in its ability to weave in so many disparate points-of-view. The kaleidoscopic perspectives generated provide a multifaceted rendering of the South Asian immigrant experience. Perhaps, most importantly, the novel serves to show us a queer Asian American character, who is able to navigate his struggles and achieve a sense of equanimity by the novel’s conclusion. If you have any questions or want us to consider your book for review, please don’t hesitate to contact us via email!